Nails 4 Dummies! : My First Watermarble! 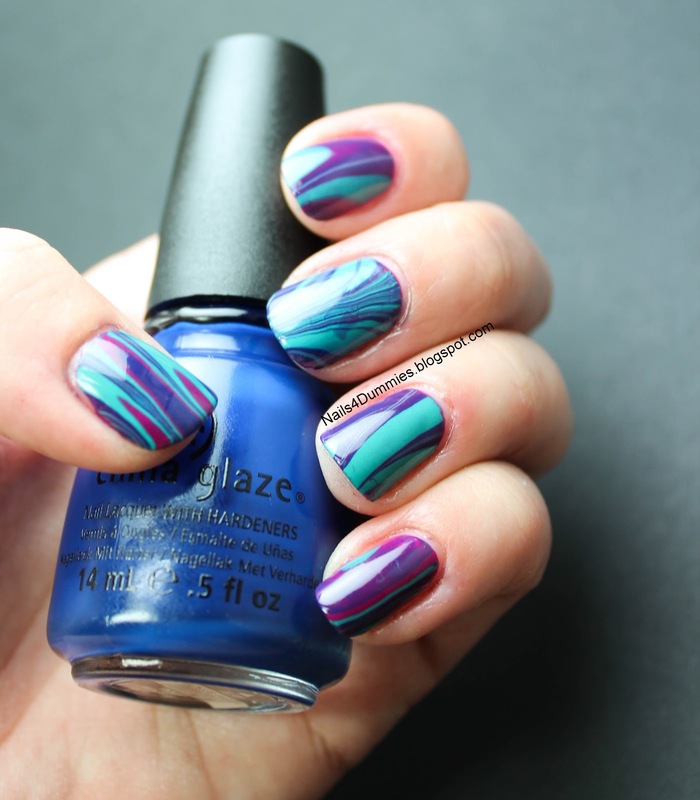 So, I've been wanting to do a water marble for a long time but to be honest, it's managed to intimidate me up until now! It was this big pink elephant in the room that nobody talked about but it still loomed! Okay, so I'm being dramatic! Just so I didn't disappoint myself, I started this project expecting this to be a learning experience but a complete fail as well. Imagine my surprise when it tuned out!! I did still make mistakes and had a few redos but if I can do this then you shouldn't be afraid to give it a try! I used all China Glaze polishes and I highly recommend them for water marbling!! I painted a base coat of Traffic Jam which is quickly becoming one of my favorite polishes - its great for stamping too! Then for the marble I also used Man Hunt and Custom Kicks which has a gorgeous shimmer to it! One of the coolest things was that where Man Hunt and Traffic Jam met I ended up with purple!! Here are the pics! * Marble your dominant hand first because once you marble your non-dominant hand you won't want to chance screwing it up marbling the other! * Be patient and let the first hand dry COMPLETELY before starting on the second hand. It may take a little longer but it's still faster than redoing the nails you messed up by being impatient! *Use very light strokes when drawing the designs in the polish! Just barely touch the surface of the polish or you will drag it all over and make a mess! *Don't be afraid to redo a finger if it didn't turn out the way you want it! Okay, I'm done for now! 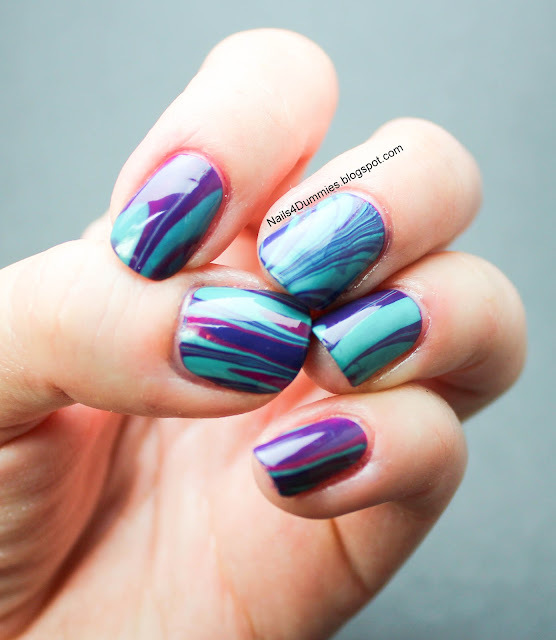 Have you done a water marble? What was your experience? Do you have any tips to share? If you haven't done one what's stopping you? You did an amazing job. Congrats on your first water marble!!! Thank you! I was so excited when it actually turned out! This is great for your first go! I've tried so many times and it's been hideous! LOL! Thanks! Sorry it isn't working out! Are you using room temp filtered water? 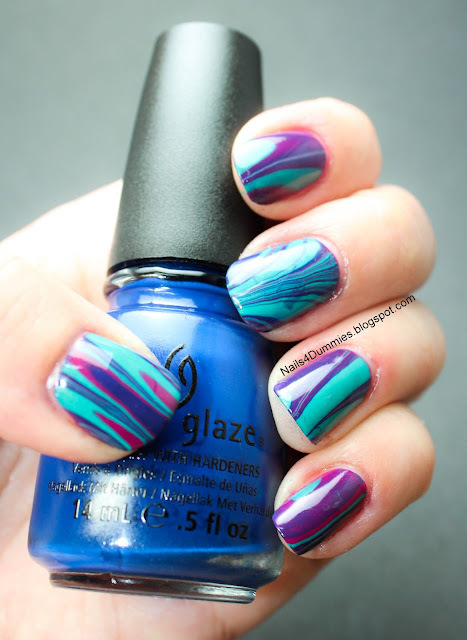 Also, I've heard China Glaze and Zoya work the best for marbling! Thanks Kristine! The funny part was that I only own 6 China Glaze :o so they were really the only three that would go together! Lol, thanks! I don't do well at choosing colors either but these were obvious enough for me! Brilliant for a first attempt :) I discovered that I could stop getting bubbles on my nails by pulling the fingers out slowly and horizontally after clearing away the excess polish. So cool! The thumb looks like a gradient zebra print! Thanks! I wish I remembered how I did the thumb so I could do it again! 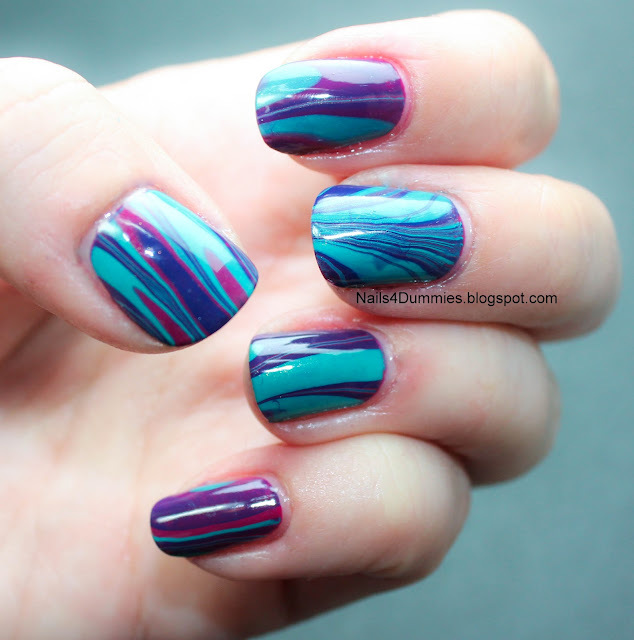 Great watermarble!! I've yet to perfect it so kudos to you! Don't give up, I think this was just beginner's luck!! Yes you will! I'm excited for our challenge!